The AIM-120 AMRAAM is an all-weather, beyond-visual-range air-to-air missile. US Air Force photo/Tech. Sgt. John Hoffmann. 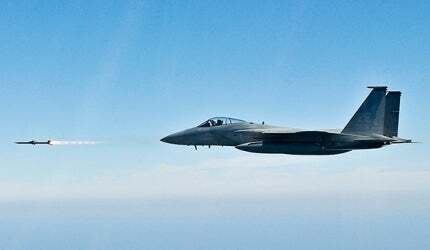 An F-15C Eagle fires an AIM-120C Advanced Medium Range Air-to-Air Missile (AMRAAM) during an Air-to-Air Weapons System Evaluation Programme mission called Combat Archer, US Air Force photo by Tech. Sgt Michael Ammons. An AIM-120 advanced medium range air-to-air missile on the right wing of the F-15 Eagle aircraft, US Air Force photo. An F-16C Fighting Falcon carries AIM-120 and AIM-9 air-to-air missiles US Air Force photo by Master Sgt. Joe Cupido. An F/A-18F Super Hornet armed with two AIM-120 Advanced Medium-Range Air-to-Air Missiles (AMRAAM) prepares to land on the Nimitz-class aircraft carrier USS Ronald Reagan (CVN 76). US Navy photo by Senior Chief Photographer's Mate Mahlon K. Miller. The AMRAAM has been delivered to 36 countries tol date. The missile has completed over 1.8 million captive-carry hours and 2,900 live firings. It is integrated with combat aircraft such as the F-15, F-16, F/A-18, F-22, Typhoon, Gripen, Tornado, Harrier, F-4, and the F-35 Joint Strike Fighter. It is also used by the Surface-Launched AMRAAM of the US Army and NASAMS (Norwegian Advanced Surface to Air Missile System). The AMRAAM is in service with the US Air Force (USAF), US Navy (USN), and over 25 US-allied nations. In August 2004, the UK Ministry of Defence (MoD) placed a $144m contract with Raytheon Missile Systems for the latest AIM-120 C5 variant. Raytheon received a $200m contract from the US Air Force for 434 missiles in December 2004. The Pakistan Air Force (PAF) placed an order in early 2006 for 500 AIM-120C-5 AMRAAM missiles under its $650m F-16 ammunition contract. In September 2006, the USAF placed a $66m Foreign Military Sales (FMS) contract to deliver 123 AIM-120C5 missiles for Saudi Arabia and Singapore. Poland received the AIM-120C-5 missiles for its new F-16 fighters in 2006. In 2007, the US Government agreed to sell 218 AIM-120C-7 missiles to Taiwan under a $421m arms sales package. The Finnish MoD placed an order for 300 AMRAAMs in 2008. Deliveries have been delayed due to the malfunction of rocket motors during cold weather tests. In November 2009, the US Government exercised separate Letters of Offer and Acceptance with three of its allies, Kuwait, Morocco and Jordan, to acquire the AIM-120C-7 AMRAAM. Chile requested a sale of 100 missiles in November 2009. Switzerland requested a sale of 150 missiles in December 2010. The AGM-65 Maverick is a tactical, air-to-ground missile (AGM) in service with the US Air Force (USAF). The AMRAAM is a joint USAF and USN programme led by the Air Force. The conceptual phase of the programme was completed in February 1979 when Hughes Aircraft and Raytheon were selected as preferred contractors by the USAF to continue into the validation phase. The programme was concluded with the end of successful demonstration of flight-tests in December 1981. Hughes Aircraft’s Missile System Group was preferred as the full-scale developer of the missile. The development was concluded during the full-scale development phase. Raytheon was chosen as a follow on manufacturer. The production contract was awarded to both companies in 1987. More than 200 missiles were test-fired during the flight-tests. Derived from the Sparrow range of missiles, the AMRAAM was designed to be quicker, smaller and lighter than the Sparrow. The missile’s layout is divided into guidance, armament, propulsion and control sections. The missile has beyond-visual-range and home-on-jamming capabilities. The AMRAAM has a length of 3.6m, diameter of 17.7cm and wingspan of 52.5cm. The launch weight of the missile is 150.7kg. It is capable of carrying an 18.1kg high-explosive blast fragmentation warhead to a maximum range of between 20 to 30 nautical miles (nm). The AMRAAM has a length of 3.6m, diameter of 17.7cm and wingspan of 52.5cm. Four variants of the AMRAAM have been manufactured. The AIM-120A is the first variant, which is no longer in production. The AIM-120B is an improved variant introduced in 1994. The AIM-120C has smaller control surfaces to enable internal carriage on the F/A-22 aircraft and carries an improved warhead. It was further upgraded to create a new variant called AIM-120C-7, which was successfully tested in 2003. The AIM-120D is the newest member in the family of AMRAAM. The variant completed its seventh test flight in May 2009, and integrates advanced hardware and software systems for improved navigation, range and HOBS (High-Angle Off-Boresight) capability. The AIM-120 AMRAAM receives information about the location of the target from the aircraft before its launch. The onboard active radar with inertial navigation system (INS) makes the missile less dependent on aircraft’s fire control radar and integrates a datalink to guide the missile. Once the missile closes to self-homing distance, the active radar guides it towards the target. This feature provides fire and forget capability to the missile and allows the pilot to fire number of missiles simultaneously at multiple targets. The AIM-120 AMRAAM is powered by a high-performance rocket motor using reduced smoke HTPB (hydroxyl terminated polybutadiene) propellant. The motor is housed in a WPU-6/B propulsion unit. An alternative rocket motor for the AIM-120 AMRAAM is being developed by Raytheon and the Norwegian defence company, NAMMO.